Just be yourself, stay focused on your strengths, allow us to remove your weaknesses,be outwardly in your approach by thinking beyond boundaries. Participate in all extra-curricular activities without sacrificing your studies. 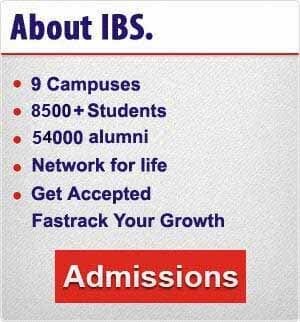 Let your personality develop and blossom and see all your dreams getting fulfilled at IBS, Kolkata. Established in 1995, IBS-Kolkata is committed to achieving the right balance between an active industry interface and academic delivery of the highest quality. The campus has natural ambience and is well connected to all parts of the city. The academic environment has a purpose with corporate culture imbibed therein. A state-of-the-art Wi-Fi campus with air-conditioned classrooms. Classrooms with Internet connectivity and projectors. Library and reading room with over 20,000 books, international journals, magazines and online database facilities. Modern security and safety measures for students and faculty. Availability of off-campus accommodation on sharing basis in the vicinity of the campus. A team of faculty members, who apart from guiding students, are also engaged in research and in conducting training programs for practicing managers. Mentoring & Coaching by Faculty. Psychological Counselling by Trained Counsellors. Soft Skills Training by experts. Students form clubs in Finance, Marketing and HR to show their involvement and teamwork. Annual cultural festival- BRIO is organized by the students. Many opportunities for students to participate in joint research projects and with industry and consultancy assignments. Students participate in various social service activities. Dr. Ajay Pathak, Director at IBS, Kolkata is a Phd from IIT Kharagpur from where he also acquired his engineering degree. He is a fellow of Cost and Management Accountants of India from ICAI, Kolkata. 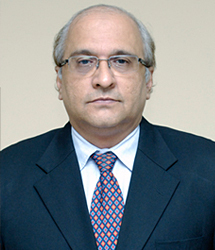 He has worked in senior positions in Banking Industry for 25 years. He is a Certified Associate of Indian Institute of Bankers and also a member of Economic Affairs, Finance & Taxation committee, Economic Research Cell at Confederation of Indian Industry, Kolkata. He has been associated with IBS for last 15 years in several capacities. He has taught several subjects in the domain of finance and banking. He has published several research articles on Risk Management in various journals of repute. He has also edited several books on various topics ranging from pricing and branding of financial products, sovereign wealth funds and Asset liability Management in Banks. He has conducted several Executive Development Programs for Corporate on Risk Management and Tax Management. He has also several consultancy assignments to his credit. He has been nominated as Co-Director of PRMIA, (Professional Risk Managers International Association), U.S.A, Kolkata Chapter to spread awareness about risk management amongst students, academicians and corporate. Through Campus, Amit was placed as Manager at Sterling Securities Limited; In August 1998, he decided to pursue PhD program at Kent State University. In 2002, Amit joined Indiana State University (ISU) at Terre Haute, Indiana, USA, as an Assistant Professor of Finance. At ISU he was also awarded its prestigious Promising Scholar award for the year 2006-07. In 2008, Amit moved to Peoria, Illinois, USA to take up a position at Bradley University, where he continues to research and teach undergraduate finance students, and graduate students in the Masters of Science of in Quantitative Finance program. In the last five years, Amit has been associated with the Journal of Financial and Economic Practice as an Associate Editor, and this year with the International Mathematical Finance Conference. Lahiri Basu – 2006 IBS Kolkata, Manager – Business Development, TRF Ltd. was placed with the largest ecommerce company of the country, mjunction services limited a TATA group company. After spending more than a half a decade with mjunction, she took an internal group transfer to TRF Ltd, one of the premier bulk materials handling organization of the world.